The date is January 3, 1954. 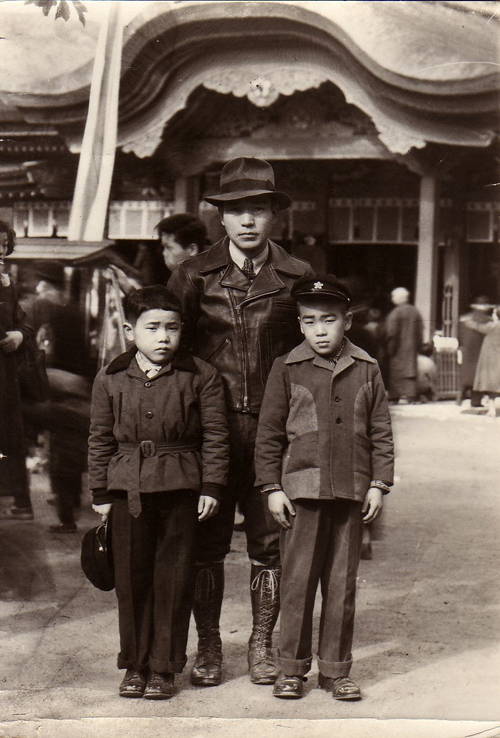 Pictured in the center is my grandfather Yukio (known to me as Ji-chan, Japanese for Grandpa). My dad (pictured on left) is 9 here, his brother a couple years older. The three of them are getting ready to leave Japan for the first time and emigrate to California. My Japanese-American grandmother (born/raised in Calif.) had earlier left her family in Japan in order to find a job, a place to live, and get settled here. Then she sent over for her husband and kids to come and join her in the States. This photo of Ji-chan reminds me of a Japanese Indiana Jones with the leather jacket and fedora, ready to go on an adventure in a far-off land. He always looked sharp when he went out. Ji-chan was always a bit of a mystery to me as there was a language barrier (he spoke only Japanese) and he was a quiet man. But I really loved him. He would sneak behind my grandmother’s back and smoke cigarettes in the garage or in the car. I’d always laugh at him becuase it was so obvious. He would awe me with his yo-yo tricks. When I was little I’d hold his hands and he would let me step on his toes while he’d walk around the house. And he was a highly regarded gardener in the Japanese community and won awards for his amazing bonsai plants. He was in his backyard garden, sitting at a chair next to a little table tending to one of his mini-tress when he passed away when I was 14. When my grandmother discovered him she thought that he was simply taking a nap because he looked so peaceful. When I saw the pictures of my graceful compatriot on your site, I felt the urge to send some of my most cherished family photos too, those of my paternal grandmother Theresa Moreira Reis. She was born in 1903 in Recife, Northern Brazil, daughter to the city’s most sought-after tailor. Politicians and other affluent people were part of his clientele, and her father’s work influenced her sense of style throughout her life. Grandma Theresa was congenitally chic, and unpretentiously glamorous before fashion was in fashion. Her European taste in dressing must have made her stand out there and then. I am in love with this woman. I can only hope that I would have been as chic as she, had I grown up in her time period. KEEP THE PICTURES COMING! so interesting! These are my favorites so far. Finally some contributors who can write! The Asian photo is just perfect. Their facial expressions encapsulate a story of leaving one's country – excitement & nervousness, eagerness & reluctance. These are all so incredibly lovely. I have been enjoying these beautiful vintage photos- what a great idea – as well as appreciating your eye in 'man/woman on the street' style. I would like to comment on the story with the first photo here – I believe this is the first time that I have heard of the woman coming to establish herself in the new country, and then sending for the family – usually I have heard it the other way around. Neat! What an amazing two photos. I'm Mongolian living in Japan, so the first picture really hit me with this nostalgic idea of what Japan was like many years ago. It just fills my imagination about the world they have experienced that's forever lost to us, but somehow reachable through their souls captured in this photo. So thank you for this wonderful moment. This is such a good thing to do, Scott … the photos are just wonderful. It's a wonderful window into twentieth-century social history, too, and I love the comments of the people who have contributed. Are you a quarter Japanese? The Japanese term is "hapa," meaning half or mixed. from all these photos i'm seeing a common affinity for hats. Beautifully worn, and beautifully worn. i love the expression in the woman's eyes peering out from under her cloche hat. she's completely mesmerizing….. I'd die for her hat. . . there is an alluring mystery to this beautiful woman. . .my favorite so far. My favorite pics so far. I am really enjoying these contributions from readers. i've really been enjoying these photos… keep it up! it's wonderful to see how style has always been a passion for people, any year or time. The first picture is amazing!. Reminds me of my grandfather. Killer boots, Ji-chan! A Japanese Indiana Jones, I love it. I love these photos! I recently found some great old black and whites of my grandmother when she was a child…I just think the woman back then had instant chic built right into them! Jiichan story is beautiful! I wonder where they took the photo. New years so it could be Meiji Shrine?? The cloche is to die for. Like everyone before me, I agree, amazing stories and amazing photos. How sad you lost you Ji-chan at only 14, thank you for sharing that with us. And….. my God…. that hat!!!!!!!!!! AGREED! This photograph of the Japanese family (the most dandy of them all) is so inspiring. The detail, fit, and textures present in all three of their outfits is amazing. As well the composition of the photograph is beautiful and truly tells a story. I really hope this photograph is selected as the winner as I think it really embodies the essence of this blog and Scott's perspective of fashion. I love ji-chan's lace-up boots. They're too funky! I am so touched by the story of the Japanese American grandfather. Ji-chan's look is unbelievable and Thereza was not doubt a very elegant lady. The top photo of the three Japanese males is just beautiful, and I love the comments that accompanied it. Such style, and such a fantastic photograph! These images are all so moving. I love the individuality they all express, through style as well as expression. I also love that so many of these people are clearly not "elites", and simply have great innate style. Keep them coming..
Hi! Thank you so much for featuring my photo (the Japanese pic of my family). This made my day! These lovely comments make me feel all warm and fuzzy inside. You readers rock! I only want to say what others have probably been saying – NICE STUFF! Check mine up. Street fashion blog from India. Ji-chan's hat is … incredible! I've never seen such a beautiful hat before, it's perfect. Oh, how wonderful to see that Grandma Theresa's picture made it here! 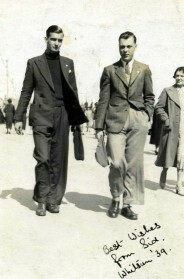 This was taken together with Uncle Pedro in 1929. She used to call me "the greatest happiness in the winter of her life" because, when I was born she had not expected, at the age of 73, to have any more grandchildren. They say I resemble her in the manners although she passed away when I was only 13. I wish I had had the chance – like my siblings – to have met her as a woman and not only as a child. This is my small homage to her. thank you so much for sharing. i really enjoyed this post a lot! Thanks for taking your blog to the next dimension! How awesome is that cloche hat? People dressed with more humility in days of yore, it was less about branding, more about the craft of fashion. i think. Scott, more proof (as if it were needed) that what you do goes beyond documenting taste. These stories open a whole new window into the role both personal style and photography have in shaping memory and, through that, collective experience. First:Thanks for the storys of your life. Picture of Japan:clothes are still modern and could be worn today. 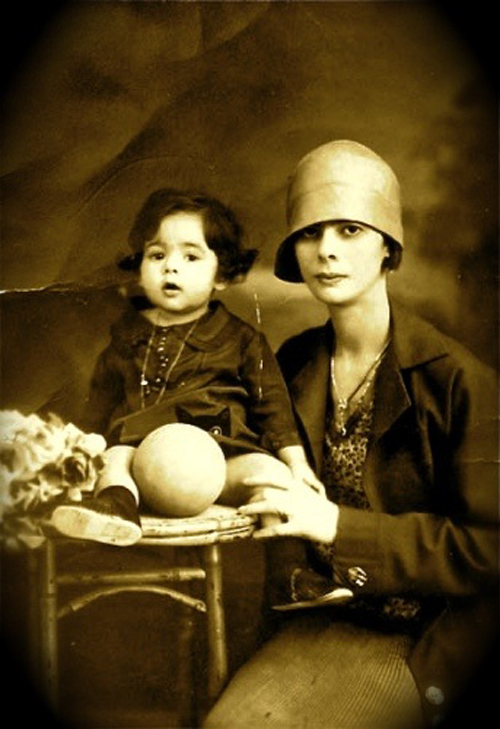 Picture of Brazil:I love the cloche hat.Mother and daughter like Jeanne Lanvin and her daughter in those years. I am in awe and in love with this brazilian snapshot sent to you Mr.Scott..evokes eternal style and sense of past. just lovely. The Japanese-American story reflects mine quite similarly. These vintage photos have less to do with the style of the subjects but the lives they have lived. These photos are merely a few seconds in their full lives and it's fun to complete the rest of their untold stories with the image of their faces. the pictures are great. so artful! wow. The japanese picture is unbeliavable. Look at the guy's outfit, it's amazing. It doesn't look 50's at all! the fedora is cool, the leather jacket is so rad, it looks really modern with the diagonal zippers, it doesn't look like the leather jackets in the 50's ! And then the pants tucked in those amazing boots. too too glam. just saw chanel & igor – has the same look as the actress in that movie – beautifully elegant face, long neck, the pared down silhouette, the cloche of course & hair… how elegant that era was! hhm.. I think that Japanese would win the contest. I really love these pics, well actually all the old ones, I find them so inspiring. I'd have loved to participate on the Vintage Photo Contest becase I have a lot of photos from my grandma, which are delightful, but unfortunatelly the term is over.Thanks for owning such a great blog. The high lace up boots Ji-chan is wearing are outstanding, to the point of elegance. And absolutly loving this contest!!! Hats seem to evoke an air of civility–or maybe it was moreso a reflection of the times. I like the top photo especially because there seems to be a story looming behind the short writeup about the Japanese grandfather. He looks like a real character and that he had some interesting stories to tell. He knows how to wear his boots like a military man WITH a motorcycle jacket. Not everyone can pull that look off with conviction. This man was a walking book/movie himself–I bet. 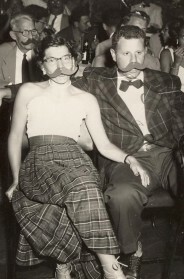 I love all these vintage photos and the stories behind them. I hope you continue to post them long after the contest is over. What a fabulous idea – very inspiring. Love these pix! Truly elegant people. I have just noticed she is wearing a jaguar-printed blouse and an oversized blazer on top! More modern combo, impossible. Avantguarde? i love the 2nd pic so much!!! Gorgeous, gorgeous. The hats! It's all about the hats; they really set the visual and emotive tone. This photo reminded me of my ji-chan.I also loved ji-chan who was gentle and calm. Nice photo and story. Great the initiative of the Vintage Photo Contest! Ins't that amazing how much "real life" can one image condense? Fantastic lessons of being elegant no matter how difficult the situation could be. Thanks for curating them. maybe i'm just a huge sap but the photograph and story of the Japanese family and particularly the grandfather was so touching that a tear came rolling down my cheek! that one gets my vote, for sure. I'm LOVING these pics and little pieces of personal history that come with them. It's wonderful!! You have a little brazilian blood in you, i knew it! and love u even more for it! how cute is that hat!!!!! i love this picture!!! Thank you for the beautiful pictures and stories. I'm Japanese and emigrated to Canada last year. I enjoyed your Ji-chan story very much. He has a very cool style;especially back in those days! I'd love to see your Oji-chan's bonsai plants and gardens. I love the photo of the two boys pictured with their father. I think this picture captures not only the style during that time, but the emotions a family can experience when someone is about to make one of their most important changes in their life, as it is to leave their homeland. Their emotions really transcend the simple shot. i was so touched by your post. i'm also japanese, moving to california in this august. made me happy that you have japanese blood and understand our culture…. Ji-chan is so cool ! Nice picture! As "italo brasiliano", this picture mean something to me. Have you ever been in Brazil? 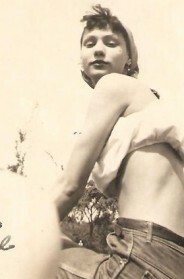 Your Grandma was absolutely beautiful; so cool (in the traditional sense of the word) and elegant. This is lovely photograph, I like the way the child's ball echoes the shape of your Grandma's cloche hat. Perfect. I love these stories. The Japanese one is amazing. Makes the pictures so much more lively. Great concept. Can I still post one of my grandfather, an amazingly stylish farmer and pioneer. I believe this is the first time that I have heard of the woman coming to establish herself in the new country.I enjoyed your Ji-chan story very much. He has a very cool style. I want to have these clothes!!! Aren’t they cute in their Thom Browne for kids!